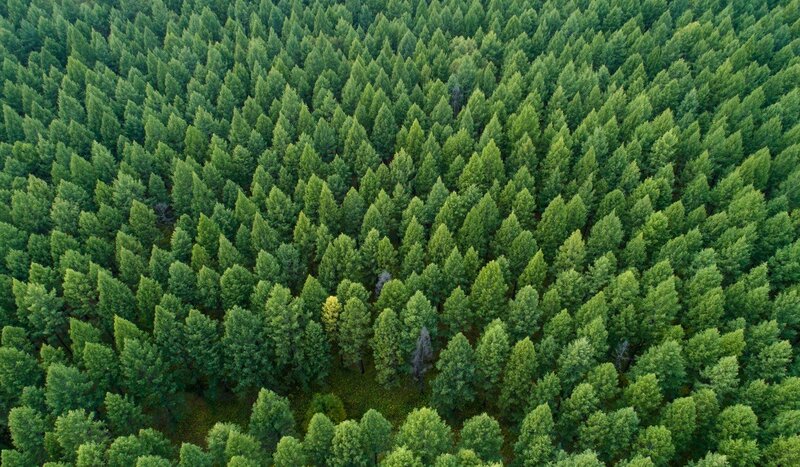 Scientists say forests are the ‘unsung hero’ of climate action in advance of Monday’s Intergovernmental Panel on Climate Change (IPCC) report. In related news: NRCan’s chief scientist uses LiDAR to assess forest change; a Georgia professor is measuring the pros and cons of increased CO2 on tree growth; the World Resource Institute has a new report on the value of tropical forests; and a Chinese researcher says mixed forests can absorb twice as much carbon. In other news: Mercer International is acquiring two Daishowa-Marubeni’s mills; BC signed a reconciliation agreement with the Sechelt First Nation; BC’s movie industry goes green with FSC; the construction revolution goes modular with CLT; and the US is not invited to Canada’s 13-nation meeting on the WTO. Finally, a death cap mushroom advisory is put out in BC; and can legalization of cannabis save our forests? A 50 per cent stake in Quesnel mill Cariboo Pulp and Paper (CPP) has been acquired by Mercer International. …Mercer bought the CPP stake via the acquisition of Daishowa-Marubeni International (DMI), which had the 50 per cent interest in the Quesnel mill. DMI also owns and operates a mill in Peace River, Alberta. CPP is a joint venture with West Fraser, which will still own the other 50 per cent stake. CPP employs around 350 people, according to the Mercer press release. …“We are delighted to welcome the employees of DMI to the Mercer team and, consistent with all our operations, we look forward to working with our new government, community and First Nations partners in alignment with our core values of health and safety, sustainability, integrity, innovation and performance excellence,” said Mercer CEO David M. Gandossi. TORONTO — Mercer International Inc. has signed a deal to acquire Daishowa-Marubeni International Ltd., which owns a bleached kraft pulp mill in Peace River, Alta., and a 50 per cent stake in a joint venture which operates a bleached kraft pulp mill in Quesnel, B.C. Under the agreement with Marubeni Corp., Nippon Paper Industries Co. Ltd., and Daishowa North America Corp., Mercer will pay $465 million for the assets. Mercer says the deal will boost its annual production capacity for pulp by about 41 per cent. DMI also holds 20-year term renewable forest management agreements and deciduous timber allocations in Alberta, with an annual allowable cut of about 2.4 million cubic metres of hardwood and 400,000 cubic metres of softwood. …The deal is expected to close in the fourth quarter of this year. Some 1,600 workers at 13 northern B.C. sawmills will be in a strike position by Saturday morning – but won’t necessarily take to the picket lines at that time. …At the request of Conifer, the employers’ bargaining agent, the sides turned to a mediator last week but little if any progress was made. …”We were hoping that by issuing our strike notice it may spur the employer to come back to the table and see if we could hammer out a fair deal for the employees,” O’Rourke said. …O’Rourke said Conifer is seeking concessions despite the industry enjoying strong demand for its product thanks to a buoyant U.S. housing market. 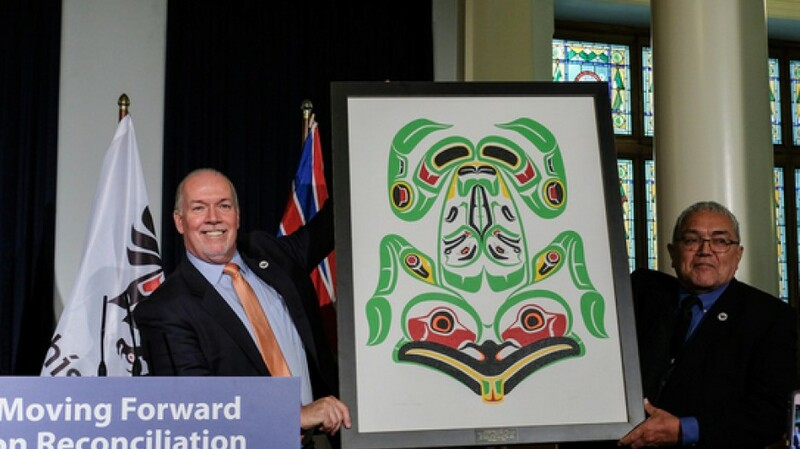 …He said it’s the closest it’s come to a disruption on the forest industry since 1986. …Conifer is offering annual wage increases ranging from 0.5 to 1.5 per cent over five years. Environmental Steward of the Year — Resolute Forest Products: This award recognizes outstanding achievements by industrial corporate citizens for successful environmental practices and conservation measures. Eligible initiatives can focus on a number of topics including, but not limited to, energy and water conservation, use of renewable resources, reductions in emissions, procurement/supply chain sustainability, packaging and recycling, waste prevention, alternative fuels, green building initiatives, etc. Resolute Forest Products invested more than $100 million in 2015 to create better efficiencies within their business. They followed it up with $300 million in additional investments to build a state-of-the-art tissue facility. These investments have resulted in the company cutting their emissions by 63 percent and their indirect emissions by 72 percent. Five months after the May 1 beginning of a staggered layoff affecting nearly 300 employees at the Georgia-Pacific paper mill in Camas, displaced workers are still waiting to hear if they might receive Trade Adjustment Assistance (TAA) benefits from the federal government. “I expect to receive the final decision in a week, maybe two,” Greg Pallesen, president of the Association of Western Pulp and Paper Workers, which represents mill workers throughout the Western United States, said Monday. “We expected that we might have a little difficulty getting TAA.” The benefits are meant to support workers displaced due to foreign import competition or offshore outsourcing of jobs. …“A significant reason for the major downsizing of this facility is the ability of countries outside the U.S. to produce the same product for a lesser price,” Palleson stated in his appeal. VANCOUVER — The movie industry has always been at the forefront of change and the next frontier is making films and TV that are more environmentally sustainable, says producer Clara George. …George says she and her staff employ numerous sustainable practices. … “Reduce use of plastics, and that can be anything from plastic water bottles to plastic cutlery … that would be quite a goal, and reduce fuel consumption.” …Harris says much of the wood used in set creation is lauan wood. “It’s smooth and the industry loves it, however, that wood comes from Southeast Asia, so rainforests are being cut down for that wood.” If the wood is Forest Stewardship Council certified then it is a better option, she says, adding that anything with an ecolabel is more responsibly managed. The BC Building Code Changes are Coming – Don’t miss this brand new Fire Performance Demonstration Workshop. This workshop is a MUST for Architectural, Structural and Fire Engineering professionals, building and planning officials and regulators, Fire Services, Insurance brokers and underwriters, Developers, BC Housing Licensed Builders, and Installers. The new 2018 BCBC (effective Dec 10th, 2018) and the 2020 NBC will allow BC design teams to build with wood, in larger and taller mixed-use structures. Elements of these structures will require a 2-hour combustible construction fire rating. Taller and bigger wood buildings require diligence, knowledge and skill in addressing concerns about fire. Wood WORKS! BC invites you to an innovative, entertaining, interactive – but mostly educational — single day event that includes classroom lectures with ten featured speakers and five “roll up your sleeves” interactive sessions. The day will conclude with a live burn comparing several very large (8’ x 8’) demonstration boxes, each built to code. “Eyesore or work of art? Better make up your mind quick, because the … façade of the Khyber Pass restaurant might not be there for long.” The above sentence began a 2009 article in the Montreal Gazette… Nine years later, the Afghan eatery … is again at an impasse with the city of Montreal over its distinctive wood façade. “Dear clients, come contemplate the façade while it’s still possible,” read a post in French on Khyber Pass’s Facebook page. “The city is demanding we take it down because it’s not contemporary and according to the tastes of the borough’s bureaucrats.” …Designed and constructed by sculptor and painter Sami Akrout at a cost of $50,000, the all-cedar façade was a tribute to the architecture of Afghanistan. But from the beginning, the project ran into trouble with the city. MOSCOW, Idaho – The University of Idaho’s planned Idaho Central Credit Union Arena will … is a vision of what architecture and wood can create. …Built of wood harvested from UI’s Experimental Forest, some of it fashioned into massive laminated beams by Boise Cascade, and hauled by Jack Buell Trucking to a campus site prepared by Buell, the building will be nearly unique in the U.S. The partnership between a number of Idaho timber companies, industry associations and the university to build a mass timber arena is unheralded. The closest similar athletic site is the 8,000-seat Richmond Olympic Oval that hosted speed skating at the 2010 Vancouver Winter Olympics. StructureCraft Builders, which developed the roof design for the Richmond Oval, is also involved in UI’s project. The dramatic building attracted proposals from 15 architectural firms, Perry said. “The industry is buzzing,” he said. The commonwealth of Pennsylvania has updated its Uniform Construction Code for the first time in a decade, according to Contractor. …In a controversial move, the ICC will vote this fall about whether to adopt mass timber high-rise construction codes. Proposed code changes, which have already been approved by the ICC Ad Hoc Committee on Tall Wood Buildings, would allow wood high-rises up to 18 stories. The committee acknowledged that there was some opposition, particularly form the Portland Cement Association, to allowing such construction, but attempted to alleviate fears by making assurances that its decisions were based on stringent analyses and fire testing… If the ICC does end up incorporating mass timber high-rise regulations into the I-Codes, just like in Pennsylvania, states are under no obligation to adopt them. Oregon, however, has already embraced tall wood construction and has developed its own codes allowing it. An unusual apartment high-rise could be coming to downtown Milwaukee: a 21-story tower that uses high-grade timber, not steel, for its frame. The 201-unit development, named Ascent, would be one of the tallest such buildings in the world, according to its developer, New Land Enterprises LLP. …The project would use an unusual but trending construction technique known as mass timber. …Construction start planned for fall 2019. Ascent would be the tallest mass timber building in the western hemisphere, he said. It would eclipse an 18-story mass timber university residence hall that opened last year in Vancouver, British Columbia. Waugh Thistleton’s Watts Grove project raises some questions and they deliver some answers. …We have to reduce the embodied energy of our buildings and building with wood is a great way to do this… Thistleton Waugh has designed and built some of the most ground-breaking, interesting and biggest projects out of wood, using Cross-Laminated Timber (CLT). …These high quality modular homes are energy efficient and sustainable, and yet can be indistinguishable from traditionally built homes. However, unlike a traditionally built block there will be 2,350m3 of CLT making up the structure of Watts Grove, and this will lock away 1,857 tonnes of CO2, the building itself becoming a long term carbon store. …Watts Grove takes building technology to the next step, from flatpack to modular. The great benefit of modular is that you get to do all the interior work in the factory, which is much more efficient and results in much higher quality. Smoking trees: can legalization save the forests? While we’re all aware of what kind of recreational and medical impacts Canada’s legalization of cannabis will have, its environmental impacts have barely been discussed. What will it mean for our forests? …Some experts say that even 32 years after they’ve been cut down, forests aren’t the same. They may be alive with new growth, but their biodiversity is virtually non-existent, making them vulnerable to disease and infestation. 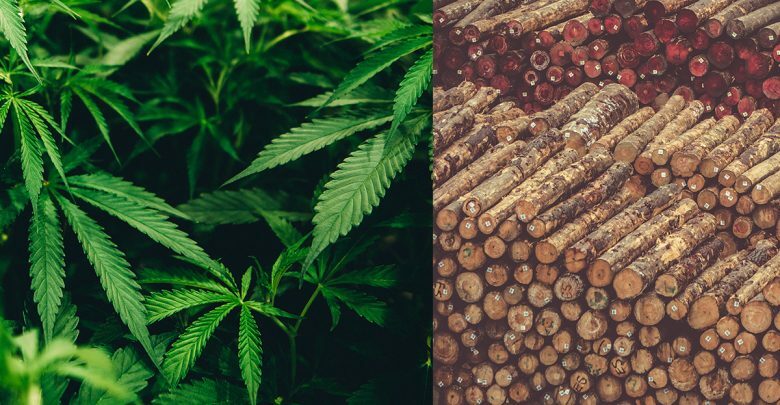 …While we cannot stop harvesting lumber entirely, did you know that hemp can produce almost every single item lumber can and more for nearly the same cost? Hemp crops can also yield four times as much plant fiber as forests can, and it can grow and thrive in even the worst kinds of soil due to its unique properties. With death cap mushrooms sprouting up in ever increasing numbers, the B.C. Centre for Disease Control has issued an advisory warning people to avoid picking urban mushrooms altogether, and to report any sightings of the deadly fungus. 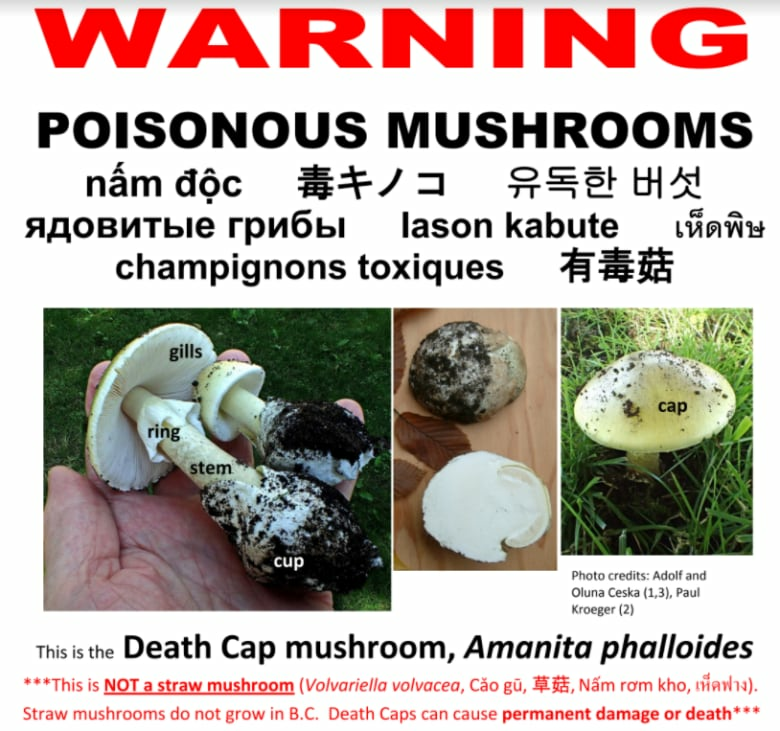 “The death cap has been sighted frequently in Vancouver and Victoria,” said Raymond Li of the B.C. Drug and Poison Control Centre. “In order to get a handle on what’s happening out there, especially for preventative efforts, we’re asking the public to report sightings if they think they’ve found it.” The death cap is the most poisonous mushroom in the world, containing toxins that damage the liver and kidneys. One death cap can be enough to kill an adult human. Death caps have now been confirmed at over 100 sites on B.C.’s south coast, including on Vancouver Island, Galliano Island and in the eastern Fraser Valley. Due to low reporting, experts believe they are likely growing in many more locations. Ryan Zinke knew exactly whom to blame for the catastrophic wildfires that have scorched California and the West this year. Touring the scarred neighborhoods of Redding in August, President Donald Trump’s interior secretary blasted “special interest” environmental groups for blocking logging projects that he said would have made forests safer. His words recalled the timber wars of the 1990s, when conservative politicians and out-of-work loggers blamed environmentalists for court rulings and a thicket of regulations that silenced chainsaws in many Western forests to protect the spotted owl and other threatened wildlife. Now Zinke and Agriculture Secretary Sonny Perdue, who oversees the U.S. Forest Service, are calling for more logging. 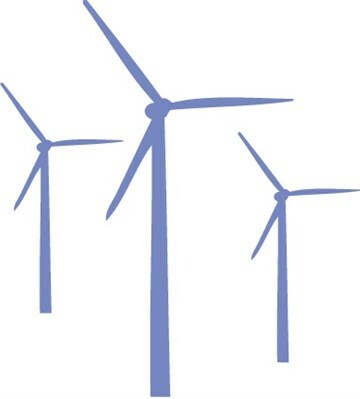 L’ANSE, MICHIGAN — Including a change to allow Large Wind Energy Conversion systems in Forest Resource-zoned districts, the L’Anse Township Planning Commission recommended zoning amendments Wednesday requested by the developer of a proposed wind farm. The panel also approved a change to the minimum ground-level clearance — the distance to the ground when the turbine blade is at its lowest point — from 75 to 58 feet. Both of these recommendations were requested by Weyerhaeuser and Renewable Energy Systems (RES), proponents of the Summit Lake Wind Project. A letter to the commission from Weyerhaeuser official Charlie Becker stated the change in ground clearance “will allow for Weyerhaeuser and RES to review more energetic turbines for utilization in the project design,” which could require fewer turbines. The Forest Owners Association has today launched a series of 28 Forest Practice Guides. The Guides are a joint venture between the forest sector and MPI and were initiated as part of the implementation of the National Environmental Standards for Plantation Forestry (NES-PF) which came into force on 1 May. The NES-PF – a set of nationally applied rules and conditions for plantation forestry was developed to better protect the environment while also increasing operational certainty for foresters. The NES-PF was designed to provide rule consistency for forestry across the county. The Forest Practice Guides will help industry and councils by providing standard practice guidance to include in management plans as part of requirements under the NES-PF. Donna Kirkwood held up the black device with its spinning sensor and slowly walked toward the crowd. “Basically we’ll be creating a video game of the forest,” laughed Kirkwood, the chief scientist at Natural Resources Canada. …The device Kirkwood tested is called a Contour and made by Pittsburgh-based company Kaarta. …Over its 100-year history, federal scientists have been able to gather a significant amount of data about the research forest — things like growth and mortality rates of trees, their resistance to insects and drought under different circumstances, and how different tree species interact with each other. 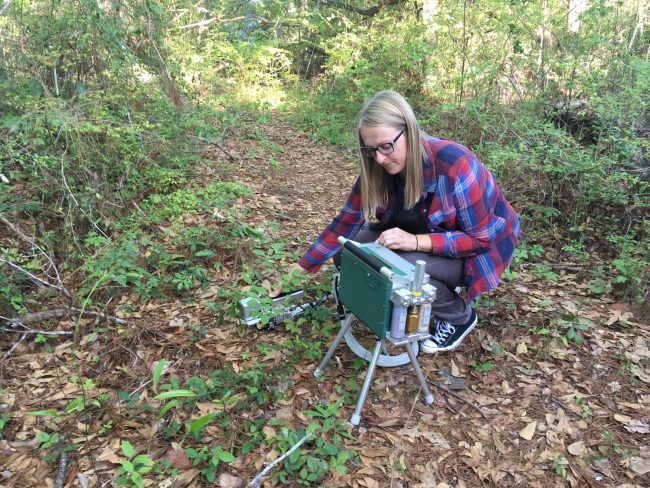 The ability to describe how the forest has changed over time helps scientists build models to predict how it will develop in future. This knowledge is particularly handy as the government tries to figure out how climate change will affect the country’s landscape over the next century. Virtually all life on Earth depends on the process of photosynthesis…. A key question for biologists is whether global climate change will help or hinder this process….Georgia Southern University professor Kerrie Sendall, Ph.D., and her colleagues have found that “it depends.” Published today in the journal Nature, Sendall and her colleagues describe the results of a 3-year field experiment designed to understand the effects of increased temperatures on photosynthesis in 11 tree species. …Sendall and her colleagues found that warmer temperatures did indeed increase the rate of photosynthesis. However, this was true only when adequate moisture was available. In all 11 tree species, the beneficial effects of warming disappeared when the soil became drier. BARCELONA – Scientists from around the world called for stepped-up efforts to use forests to keep global warming to the lowest limit agreed by governments in 2015, as a key report on how to meet that goal is finalised in South Korea this week. “Forests really are the unsung hero of our struggle to address climate change,” said Deborah Lawrence, a University of Virginia professor. …The flagship report from the Intergovernmental Panel on Climate Change (IPCC), due to be published on Monday, will outline ways of limiting global temperature rise. …One key route is to protect virgin forests, restore those that have suffered logging, fires or other harm, and expand the amount of land covered by trees, the report is expected to say. Protecting tropical forests is essential for achieving the climate goals of the Paris Agreement. Global Forest Watch Climate recently released estimated carbon dioxide emissions associated with the 2017 tropical tree cover loss data, and the numbers demonstrate more of what we already knew. Below are five numbers that demonstrate just how important tropical forests are in preventing further climate change. 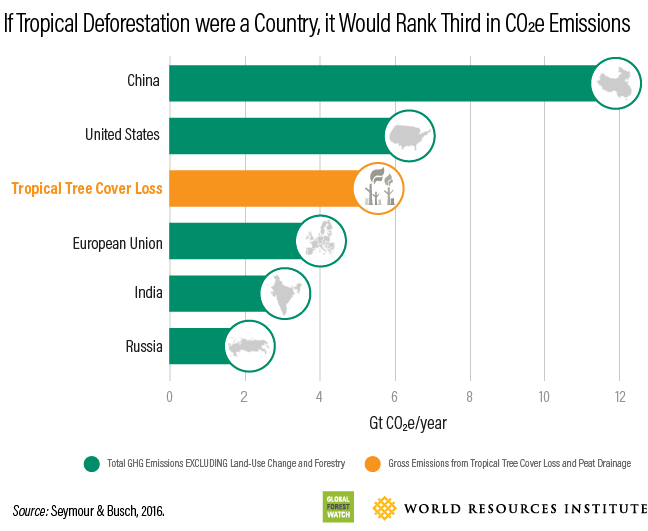 If tropical deforestation were a country, it would rank third in carbon dioxide-equivalent emissions. …It’s getting worse. Average annual emissions in the last three years were 63 percent higher than in the preceding 14 years. …Forests hold critical local cooling power – to the measure of more than 2 air conditioning units per tree. …Tropical forests are 8 percent of the problem but 23 percent of the solution. …Forests receive just 3 percent of available climate mitigation finance. Forests with a diverse mix of trees can absorb more than twice as much carbon as areas with just a single species, research carried out in eastern China has found – a discovery that could help in the fight against climate change. More than 150,000 trees were planted on a hillside in Jiangxi province in 2009 for the study. Over eight years, researchers found that an average of 32 tonnes of carbon was absorbed per hectare in the above-ground biomass – or living organisms – of the species-rich forest, according to the results published in Science on Friday. Single-species forests, in contrast, captured an average of 12 tonnes of carbon per hectare. The experiment near Xingangshan, was the first involving a large cultivated forest to find out whether a greater diversity of tree species leads to increased greenhouse gas absorption, a process that can help to mitigate climate change.